Keyers have been on my mind lately. Now that I am intending on operating less QRP I have to change my CW setup. For QRP it was quite simple: use the KX3 internal keyer to send manually and use macros within N1MM Logger+ to send "KY" commands for contest QSO exchanges. That works well, but only for that one rig. To use my FT-1000 MP in contests requires an external keyer that can integrated with contest software. It would be a solution that is transceiver independent. This becomes important for when I eventually buy one or more modern high-performance transceivers for my future station. To that end I recently purchased a K1EL WinKeyer USB kit. This product has become the keyer of choice for many contesters, and for good reason. The kit is easy to put together, only taking 2 hours of my time to build and test. It took a little longer to puzzle out the documentation to get it properly configured and integrated with my shack laptop PC. I can see myself buying more, as needed, when I build my next station. One is enough for my current modest setup. Electronic keyers have been around for decades. The earliest ones appeared in the tube era. They were simple devices that used a single-lever paddle. Push it in one direction to generate dits, and in the other direction for dahs. Proper timing of code elements was the responsibility of the operator. By the 1960s the dual-lever squeeze key arrived. This offered improved ergonomics, though nothing more at first. Eventually the iambic keyer emerged to fully exploit the dual-lever key, where closing both contacts sends dits and dahs in sequence. With the introduction of logic chips, flip flops were used to allow element buffering and improved inter-element timing schemes. Sending fast, clean CW with reduced operator fatigue was a revelation to those of us entering the hobby in the early 1970s. It was also a boon for CW contesting. Soon enough the appearance of reasonably-priced memory chips drove the introduction of memory keyers. The ergonomics of recording messages was at first dreadful. This was overlooked by contesters such as myself since the pain of programming the keyer was more than compensated by the improvement in contest scores. As a relatively new ham and budding contester in 1975 the series of QST articles for the Accu-Keyer and Accu-Memory peaked the interest of me and a few friends with similar interests. We purchased the boards from the authors and built these units. We were very pleased with the results. Contesting became a lot more fun. The authors turned the articles into commercial products that did well for a time. We were teenagers at the time and our skills at building electronics were not yet very good. He (VE4VV) used a Nye Viking squeeze key and I bought the venerable Brown Brothers dual-lever paddles; this was before Bencher paddles were introduced. I still have those Brown Brothers paddles and I still use them on occasion. The Accu-Memory itself was retired to the junk box in 1985. The photo shows the inside of the Accu-Memory keyer I built, complete with AC power supply. It could key both solid state and tube rigs by choosing the output jack. The push buttons I used were awful. You make poor choices like that when you have little spare cash. The screw on the top cover prevents the front panel from bending when the operator (me) bashes those buttons in a futile attempt to make them work. Only about one year later I learned the art of designing digital circuitry at university and discovered the horror that was the Accu-Memory design. The way they reduced the part count was by carefully engineering signalling delays between gates. The RC timing circuits on gate outputs are mandatory! With them they exploited race conditions that would otherwise require additional digital stages. While the criticism is valid I must admit they were inexpensive and worked. If there were glitches it sometimes helped to try different chips of the same type. When I bought a house and built a modestly competitive station in 1985 I upgraded everything in my shack. Looking for a better keyer design I found what I wanted (again) in QST. This was the CMOS Super Keyer by KC0Q and N0II in the October 1981 issue. The keyer evolved several times since and appears to have had considerable commercial success. Like the Accu-Memory this design also used discrete logic chips, except that they were better. CMOS allowed for low power consumption and therefore battery operation. It had a few new and interesting feature, though it was still just a memory keyer. The keyer could run on 3 AA cells for years, without the need for a power switch. Constant power was necessary to ensure the dynamic memories would not be erased. Idle power consumption was advertised as typically 10 μA. My ammeter had a resolution of 10 μA and the keyer I built read zero. The first set of batteries I put in lasted for 7 years! Unlike the Accu-Memory this keyer did not depend on race conditions. The design was much cleaner. 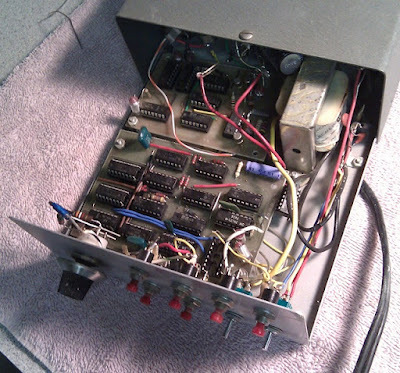 The board was of the plug-in type, which made service simpler and avoided rat's nest wiring to other components. The power consumption was so low that the memories would stay active when the board was pulled for many minutes, despite the lack of power to the dynamic CMOS memory chip. The buttons I used on this keyer look similar to those on the Accu-Memory but are in fact much better. I had the money by then to do it right. The buttons and switches are labelled, a luxury I skipped on the Accu-Memory. After all these years it's unclear what the buttons on that older device do. Assuming it still works it would require some experimentation to discover their functions. This keyer continues to work well, and I actually used it in this past weekend's ARRL Sweepstakes contest. However like other keyers of its generation it is difficult to program. The character timing during memory playback was not perfect. It also did not help that for speed control I used a rotary switch rather than a potentiometer. It's an old technology solution to allow definitive steps to speed changes. The 12 position switch does not allow for sufficiently fine speed adjustment. The keyer includes positive and negative keying circuits. This was superfluous even in the mid-1980s since by then I, like many hams, only used solid state transceivers. I did build in support for keying of multiple rigs (bottom left rotary switch). Modern technology integrates that function with the computer for SO2R contest operation. Last week I decided it was time to move on to the latest in CW keyer technology. Several generations of technology had passed by while I was out of the hobby from late 1992 through 2012. The CMOS Super Keyer, although excellent for its time, does not withstand comparison to what is now available. 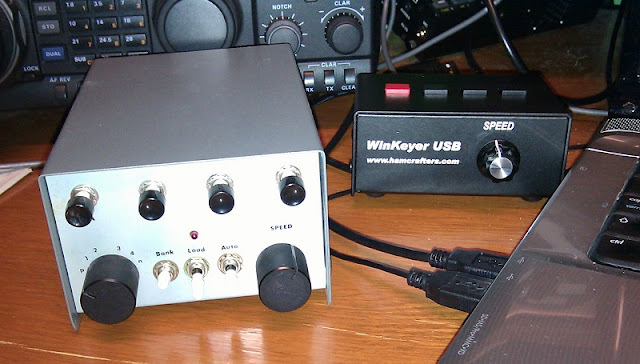 The K1EL WinKey is now a part of my station, as seen in the photo above -- the older keyer is in the frame only as part of the photo-op. It has many features of value to those of us that operate contests. Best of all is the ability to integrate with contest logging software and general logging software. Placing the buttons on top is also a plus since there is no danger of pushing the keyer backwards when manually playing the memories. With it there are no timing issues from using PC generated CW, since most desktop operating systems deal poorly with real-time applications. I had considered this option when I recently modified my FT-1000 MP. Memories and speed control are integrated with logging so that your hands might never need to leave the keyboard during CW contests. Operator fatigue is lessened, thus improving enjoyment and results. I plan the first serious use of this keyer during the upcoming CQ WW contest. Until then I am experimenting with its features as I use it for daily operating. It's proceeding well so far, though I have had some difficulty getting a few questions resolved with the documentation. One problem I did encounter is that I've run out of USB ports on the PC. It only has three and I already use all of them. I unplugged the KX3 to make room. I may eventually need a USB hub to support the increasing number of external devices connected to the computer. I don't know how much further CW keyer technology needs to advance since there may be little more of real value to be had. Most of the advancement is now on the receiving side, including skimmers and readers. Perhaps this will become the final generation of keyer technology in our hobby.